I’m always looking for ways to save time. I am currently working on a feature for Discovery Girls magazine that absolutely needed some pompoms–a lot of them. The thought of doing each one individually nearly took me under. The process to make them in bulk is quite easy and definitely beats making those little cardboard templates, which drive me nuts. 14 at a time? Now, we’re talking. I used a piano bench, but any piece of furniture with legs a good distance apart and room to bring the yarn around will work. Allie and I became a pom-pom making machine. Did you wonder what this sausage looking thing was from this Mid-Make post? Read on through the tutorial and you’ll see. Add some neon thread to your final pile of poms and you’ve got a fun garland to hang anywhere– great party fare or tween room dec. 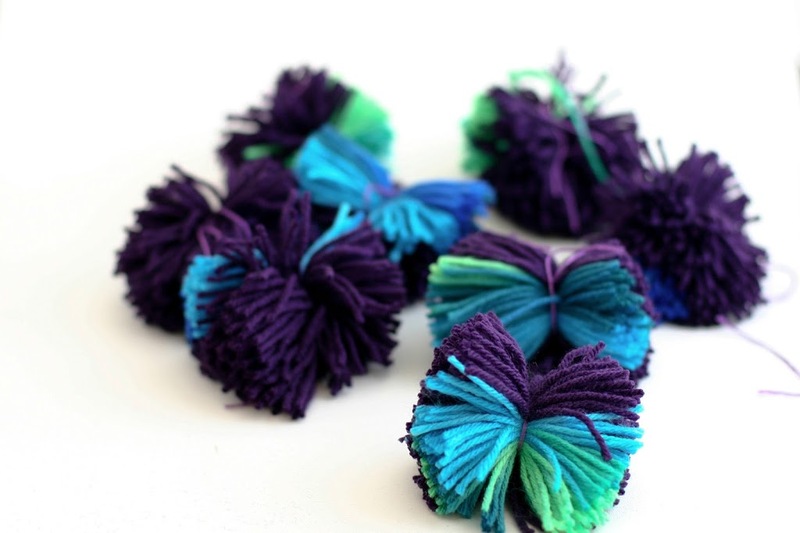 Here is the tutorial for making pompoms in bulk. ::A bench or table. A piece of plywood with nails will work also. The wider apart the two legs, the more pompoms you’ll make! Tie one end of your yarn around one of the legs of your bench. Start wrapping around the two legs. This is a great thing to have kiddos help with. Wrap a ton of yarn. It takes more than you think it will. I like the fluffiness of my small poms, but the big poms I made were a little weak. The large poms pictured here had a center about 1″ wide, and the actual poms were 3″ wide. I think the ratio would need to increase to 2:1, meaning create a 1.5″ center for a 3″ pom to make them full enough for my taste. You can test the width of the center circleby squeezing the bulk of yarn together between your fingers and estimating. When you have enough yarn, tie the end of the yarn to the leg of your bench. Now, you want to secure the center of your pompoms. Cut a number of pieces of embroidery thread approximately 12″ long. This will provide enough length to hang the poms if you choose. You want to tie the thread at regular intervals across the hank of yarn. Decide on the size of your pom and use a piece of embroidery thread as your guide to measure evenly. The small poms you see are about 2.5″ poms, the larger ones are 3″ poms. When you tie the thread, you want it to be as tight as possible. When tying, during the initial cross over of ends, wrap the thread around twice before you pull tight. This will help it keep the tie from loosening, then complete with a square knot. Tie the thread around again. It will look like this after you tie them all off. At the end, fold your measuring thread in half to appropriately measure the end cut. Repeat on the other end. Now you have a link of pom sausages like this. Cut straight down the middle of each section, doing it in two parts to get as straight a cut as possible. After you cut in the middle of each section, you will have pompoms that looks something like this below. Next step is to trim and fluff the poms. As I mentioned above, I wish that I had added more yarn to these poms. I think 3“ poms need a center of at least 1.5″, and 2.5″ poms would need a center of 1.25″ etc. To trim the poms, put your thumb and forefinger at the middle of the pom such that each finger is on either side of the center circle. Be careful not to trim the threads used to tie the center if you want to use those to hang your pom. Trim pom to get an even circumference throughout the pom. Repeat with each pom and you’re done–over 8 large poms all at once or 14 medium poms. To make a garland, find a fun thread to string your poms on. Bring embroidery thread through the center of each pom with a needle. Adjust the width between each pom and hang. Yay! Super-fun. Happy pomming. This is one of the best things to happen to crafting since glitter! What an awesome idea!! Was thinking of making a pom-pom bunting for my room using my leftover wool, this will save so much time, so thanks for sharing! Oooh, steaming the poms. I might just try that! Thanks Betz! I have an old travel steamer that would work easily. Specially for the garland … fire ‘er up and walk up and down with the little steamer. Thanks all for your pomming enthusiasm! I’m glad you dig the tute! this is so so brilliant! thank you!!! Oh my goodness, this is brilliant! For some reason (perhaps the frequent party- throwing that goes on), we go through a TON of pom poms around here. Pom poms in bulk = sheer genius. This just made my Truffela garland for my kids’ Dr. Seuss birthday party about a zillion times easier! Thanks a billion! Yay! I love to think of that as a use for these! This is a great idea! I have a thought to make it even easier, why not turn the table upside down? It would make winding the yarn easier. I’m so going to do this! Petra! I laughed out loud when I read this. That is so obvious and so smart, it’s crazy! Would be much easier that way :). YAY! I think I’ll update the post to say so! It does. I turned my card table on its side and wrap enough yarn to make 60 pom poms before I cut them! Cool idea, I’d also tie it at the ends, on the leg of the chair, so there’s no waste. Pom Poms always seemed to be so long winded when I was a child and here we are mass producing them with minimal effort. Thanks for sharing this. Seems so obvious now that you have already thought of it! Thank you for sharing this genius idea! This is the best method yet! I pinned it… and then pinned it again! It’s really hard to find. The only difficult part: it takes a ton more yarn than you think! My first batch was wimpy and pathetic lol. But anyway… YAY AWESOME TUTORIAL! It does take a shocking amount of yarn, but worth it in the end when you get so many out of it! So clever !!! I have just featured your tutorial on my blog, linking back to you website. Thanks for sharing such a brilliant idea, that will save me a lot of time in the future !!! Thank you Virginia! What an adorable blog! I love it. Thanks so much for sharing. muy buena idea! te felicito!!gracias!!! very good idea! congratulations!! thank u!!! This is absolutely brilliant – thanks for sharing!! This is the MOST clever idea that I have seen! I love it and will definitely give it a try. Can’t thank you enough. Thanks for sharing. Thanks so much you all. You make me feel very smart :). Our knitting group has just been asked to do our first yarnbomb. This is going to be PERFECT for that. Thank you so much! 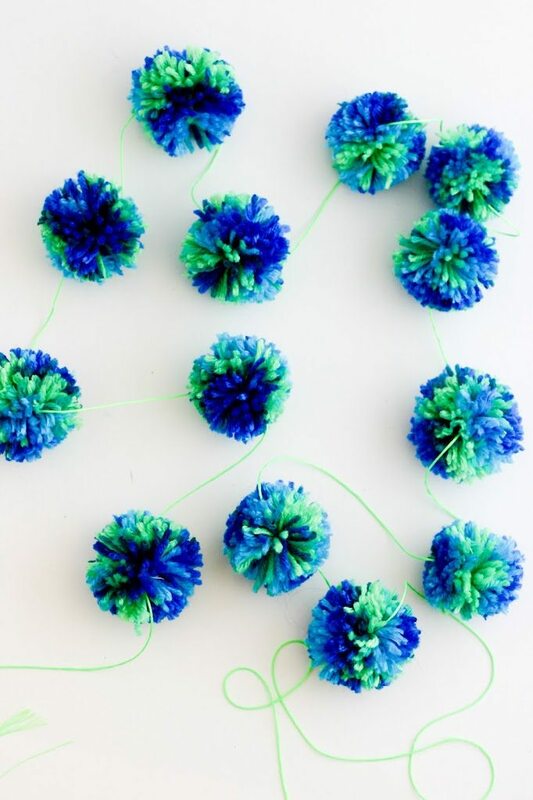 Thank you for sharing your crafty way of making multiple pom-poms. I will remember to do this next time I need pom-poms. I’m all for mass producing and this is a great innovation. Thank your for sharing. Pinned. Well, that’s just the best idea EVER!! You should patent this!!! Fab!!! Thanks a million!! YES! I agree. hmmm . . .
That is absolute genius. Thanks for sharing! Now I shall have pom garlands everywhere. so to switch colors and continue wrapping with a new skien would you tie two loose ends of yarn together?? love this idea/tutorial! exactly. You definitely need a ton of yarn, so keep wrapping away! Una idea genial. Gracias por compartir. so glad to see this post from my FB !!! Yay!!! Thanks so very much!!! Thanks for the idea ! simple and efficacious ! Oh my! 🙂 Well, for next time! I tried it this weekend to make decorations for a birthday party and it work out brilliantly. Thanks for the tutorial!!! So excited to come upon this as I am getting ready to make a gazillion of these things for a baby shower. When making these one at a time, I generally wrap the yarn 100 times (I like them full). Using your method, did you use a whole skein? Do a rough count of how many times you wrapped the legs? Our closest craft store is a “pack your lunch” 36 mile trip away… I want to buy enough yarn, yet don’t want to overdue it either… who wants to make ANOTHER one of those trips to return a skein or two of yarn or worse, have to make it just to buy one. Any help you can give will be most appreciated! Hi Susan! I didn’t use a whole skein, more like 3/4. I judged it by how thick it felt when I squeezed it in my hand. I don’t know how many times we went around – a lot! I think I got 14 poms from going around that 3′ piano bench. Yes, I feel you about the trip to the craft store – yikes! I hope that’s helpful. I would buy a little more than you think you need an just add more festiveness that baby shower or use them for other wrapping decorations, etc. Good luck! Fantastic! Shared on my blog. Thanks so much Lee Ann! I’m glad you like it! This is so much fun! I love the colors and the idea. This would be a great way to DIY decorate for basically any holiday. Glad I came across this on Pinterest! Thanks so much! I’m glad you like the tutorial. It is perfect to make a ton of poms for the holidays! This is realy a great solution for pompom making! Wait til the summer!! Gonna get the kids to go round and round 2 garden stakes in the lawn!!! Great outside activity!!!! What a fabulous idea! have fun!! Qué buena idea….! Me ha encantado…..! Fabulous, fabulous, fabulous…thank you Pinterest for for my finding this tutorial!!! Thanks for finding me! and thanks for taking time to leave a comment! For real; this is a completely genius idea! I can’t wait to try this myself. Wooooooooooooooooowwwwwwwwwwwwwwwww . . . . great idea!! . . . . I will do a garland for my Xmas tree, combining the colors which will predominate . . . fuccia, orange, yellow, turquoise, purple . . . it will look great with all my Peruvian ornaments. Yay Marina! I love your enthusiasm! So excited for you!! Thanks a lot for your pom-pom tutorial. I’ll have another project to work on. Yay! Majorly in love with these. Can’t wait to do one in Christmas colours in a few months!! This is one of the most ingenious ideas I have come across in crafting, knitting or crochet! That is an amazing idea, can’t wait to try it out. making pom poms like that is so good I never thought of that I usually make them one at a time which takes a long time now I know how to make more than one at a time thank you for putting this up here I love to crochet. Thanks so much for your comment! I’m glad that you find it helpful! Yay Amy! Thanks so much for your fun comment. Have a great time! Thanks for the tute. I made mine individually last year too but with a pom-pom maker. This is much better! Wow! I bought a $30 gizmo to make these in bulk and never could figure it out! I really specialize in super mini pompoms- less than ½ an inch which are a challenge to make beautifully round- but you’d better believe I’m buying a year’s longed for piano bench just to have success at making these!!! ha! just a thot for the person commenting on steaming them- I might consider [depending on yarn type] handing them from the curtain rings in the shower and then using a hand held clothes steamer of some repute – I have a Rowenta that’s #AbFab and would make short work of seriously puffing them up. I could see a couple big benefits to this method- it could take a lot of the hand fluffing [ time consuming ] aspect away, as well as giving a really great idea as to just how symmetrical your pompoms actually were, making those last little touch ups Soooooo much easier! also pretest yarn to ensure it can deal with the steam & isn’t made of a synthetic material that could melt instead of fluff- another big D-R-A-G! this has been one of the top three most exciting, well presented, thurō, and useable tutorials I’ve ever, ever come across! I’m not a blog reader, but I’ve been converted and will visit often as well as pin to my board, “crafty is as crafty does”, under rochellefoles on Pinterest , and I’m thrilled to post and credit you there! My 3 year old daughter wanted it to snow for Christmas but the best we could do here in Louisiana was to make yarn poms for an inside snowball fight. By the time we made 6 from cardboard templates we gave up. I k sw there had to be an easier way to make them. THANK YOU SO MUCH for this timesaver. We will definitely use this come Christmas time! The idea of tree garland sounds awesome too. How sweet! Thank you for your comment. Yay! Queria fazer um projeto grande com pompons, mas desanimava com o método tradicional. Parabéns pela extraordinária generosidade em partilhar. I have not tried this yet, but was so excited to see it! I just cut out about 4 sets of the cardboard “looms” and thought about giving up on my pompom rug project. Now I’m excited again. I can’t wait to try this! Great Tonya! Have fun! Your pom pom rug sounds fabulous!! This will be my an additional source of income sister, may God reward you abundantly for sharing it to us all. De rien! I’m so glad you like the ideal. Bonne chance! OMG THIS HAS CHANGED MY LIFE. THANK UUUUUUUUUUUUUUUUUUUUUUUUUU! I absolutely am so excited I found your idea. I’ve been wanting to make a huge pom pom rug and this sure will cut the time down. Thanks so very much for such an outstanding idea. I’m starting this right away soon as I run out for wool colors I want. Hi Jamie! I’m so glad you found it helpful! This is perfect for something like that, and pom pom rugs are the best!! Great idea!! I’m not crafty so this could be a silly question but the multi color yarn Pom Pom did you buy it that way or did you add the different colors? My little brain needs as much info as possible! Hi Jennifer, that yarn came multi-colored like that. There are a lot of yarns out there like that. They are super fun! This was a fabulous idea. I couldn’t figure out what to use. I was leaning on the ironing board thinking about it, when i decided to turn it over. Just made 16 pom poms at once in less than an hour. THANKS!! Thanks so much Melanie! Great idea to use your ironing board. I’m glad it was so helpful! Omg I love this. It will be even easier since I have half skeins of yarn that I can the directly in the skein. I’ll be doing this for my trade show booth using my hand dyed yarn for sure. Thank you for such a great post. How do you make them so puffy and fluffy? Hi Faith, The most important thing is to make sure there is enough yarn in your original bundle. If it isn’t thick enough, they won’t be fluffy. Then, you need to make sure you trim them enough to make the ends stand out fluffy. I made the mistake of not using enough yarn. So instead of feeling frustrated about it- I folded the ends over and tied with more thread and turned my first batch into fringes. Looked great as well. I’m so glad you made the best of it! Sounds like you made some great fringe! My 10 year old daughter has started a little business called Pretty Pretty Pom Pom. We are definitely giving this a try! Why would you not flip the table upside down where the open legs would be exposed? Just seems like it would be easier to load the yarn. Hi Kellie, that is how it’s done. The table is upside down and the open legs are there for you to use (in this case a piano bench, but yes!). Am I misunderstanding your question?